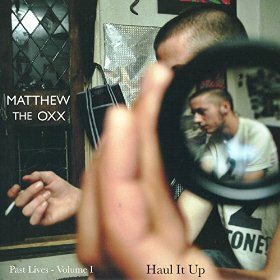 After three astonishing albums (The Polyanna Cramp 2012, elephant 2013, First Aid of the Drowning 2015) a new album by Matthew the Oxx has just been released on Wild Sounds: Haul it Up. It is one of the most surprising albums I have heard in a long while, totally different from what I expected. The first three albums have fascinated me because of their wonderful melodies and beautiful chord structures as well as their beauty in sound and substance. Lyrically they were based around love and death. Now we get something totally different: This album is more like an invitation to take action than to dive deep into emotion. The album title implies this. The title track, placed in the centre of the album is a great rock tune with a nice building up of tension. Sounds of a jaw harp seem to indicate an appeal not to take things too seriously. Similarly, in the third track Bonehouse, a horn seems to remind us that everything is not quite as serious as it might seem. Good job for a song in which the lyrics in a fantastic bridge say: "How many bones must I break before I get my piece of the cake?" There a more cracking songs on this album like the opener File Away and the final track Shine it Up - up beat songs with great guitar work, lively, enthusiastic songs. There also some quieter ones like When I leave you or Candlesong that give a glimpse of the amazing songwriting talent that Matthew the Oxx is. He wrote these songs when he was in the beginning of his twenties and they have only been released now, quite a number of years later, thanks to the wonderful independent label Wild Sounds. It's great to be made familiar with some of the musical roots or starting points of a singer-songwriter of his quality. I wish I could have that pleasure with more of my favourite singer-songwriters, I am sure it would be great fun!